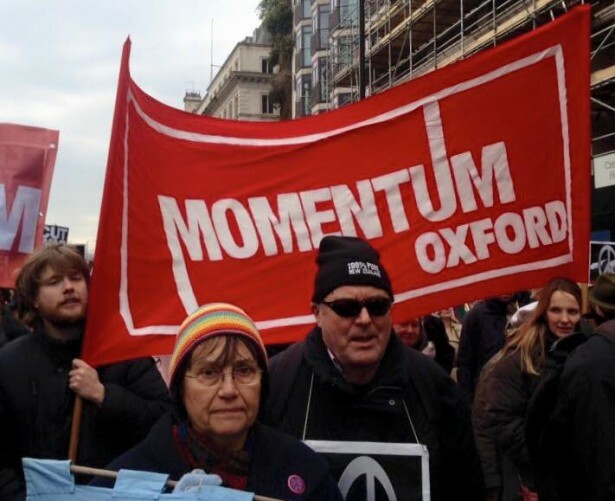 A Momentum rally in Oxford, England in February. April 23, 2016 — Links International Journal of Socialist Renewal reposted from Waging Nonviolence — After his double-digits win in Wisconsin on April 5, Bernie Sanders’s insurgent campaign has a fair amount of momentum behind it. Still, many are asking what comes next, and how to carry the political revolution forward — whether he wins the Democratic nomination or not. Lessons for Sanders might come from the movement that formed around another white-haired progressive challenger to the political establishment: British Labour Party leader Jeremy Corbyn. Riding the wave of his country’s emergent social movements, Corbyn’s rise to the top of the party last summer marked a break with Tony Blair’s “New Labour” brand. It also christened a new generation of Labour Party activists, eager not just for a better candidate but a new kind of politics. Formed just weeks after Corbyn’s election, the grassroots organization Momentum is channeling the energy of Corbyn’s campaign into “a mass movement for real transformative change.” Over a hundred local groups are now running campaigns at the local level and pushing for a more democratic Labour Party, holding a mix of rallies, town hall-style meetings and pop-up political education events. To learn more about Momentum and what it might mean for the future of the Sanders campaign, I spoke with James Schneider, a national organizer with Momentum and a journalist who’s been involved with the group since its formation. Where did Momentum come from? Why did it start? In the simplest form, Momentum is the continuation of the Corbyn campaign. Over the course of three months last summer, the left of the Labour Party went from being tiny and much-maligned to a popular movement. Party membership doubled. It’s nothing in comparison to Sanders’s half-million volunteers, but by the end of the campaign we had 17,000 activists throughout the country. In the United Kingdom that’s massive. It was bigger than the three other campaigns combined, and it had a popular political energy that hadn’t been seen for some time. Throughout the summer people like [writer and activist] Owen Jones went around the country saying, “These are the seeds of the biggest progressive movement in this country for a generation.” In one very real sense, Momentum was an attempt to give that some sort of organization. There was now a left leadership of a mainstream party of government. But also there were tens of thousands of people throughout the country who wanted to be politically active and do a lot of work. It’s not as if Corbyn turned up and everyone went, “Oh God, I thought everything was fine before.” The overwhelming majority of people know all too well things are screwed up. But now there’s hope. There’s a project for people to engage with. That all built onto something that gets less coverage, which was an attempt for three years to bring the fragmented parts of the Labour Party left together. This effort and the campaign combined into Momentum. Are there things Momentum does that a social movement can’t? How does it work? It’s a very peculiar organization. It straddles this divide between a more traditional party form and labor and social movements and civil society. None of these are monolithic. But we sit within all four of them and try to bridge divides. There are bits of Momentum that — if you’re used to more traditional movement things — you might find bureaucratic or compromising. But that’s because it is linked to actually existing labor struggles, which necessarily have degrees of political compromise within them. And it is linked to a political party whose organizational form is still very bureaucratic and 20th century in its political technology. We’ve also had 20 years of centralization within the party under New Labour to strengthen its hierarchy. So there are tensions between those things. But the benefit of having movements that are associated with parties is that movements can directly influence them, not just from pressure from the outside — which has to carry on, and is very important — but also through having this kind of umbilical link. You can make the party more of a movement party. I imagine people are talking about what happens after Bernie in the same way that we were talking nine months ago, saying, “He might win, he might not win. Regardless, we’ve got to build something with this.” You’ve got the benefit of the Democratic Party being really hollow, but the drawback of it not having any kind of meaning. If he does win, the campaign needs to open up incredibly quickly into being a citizens’ campaign, with citizen assemblies across the country. He’s not going to be able to pursue his agenda from above. What kind of space did the general election in May open up, when former Labour Party leader Ed Miliband lost to Prime Minister David Cameron? I don’t think it started with that election. If you think about the time when Ed Miliband was leader (2010-2015), you saw the “There Is No Alternative” line being rigidly enforced through institutional mechanisms around Europe. Some of those were being challenged from within and outside of Parliament as we got into 2015. That’s what helped Corbyn emerge. What could this and the rest of Momentum’s experience teach Sanders supporters? If Sanders doesn’t win you’ve got to decide what the Democratic Party is. Do you want to put a lot of effort into remaking the party? Can it be turned out of its corporatist form, and become a new party of the 21st century that is engaged with movements? Will you run an insurgent campaign at all levels to transform that party? Or will Sanders momentum go into something else? If he doesn’t win the nomination, the strategy needs to be made clear very early on. Elections are easy to run: they’re time limited, so people know that they can give up a lot of time, but know when that will end. There’s a unifying cause, and because it’s time-limited you can suppress disagreements temporarily. Afterward, when you have a series of goals — some of which may compete for time and energy and people — energy can dissipate. It would be important for some legitimate figure to hold it together. It’d probably have to be Bernie Sanders himself. I understand the problematic elements of saying that you need a singular authority figure in order to launch a sustainable democratic movement, but I think that is the case. If he does win the nomination, the campaign will carry on as an electoral campaign. It needs to become citizen-based, not party-based — and not Sanders partisan, either. You’re going to need citizens councils, public assemblies and other democratic tools to run alongside it. The party exists for purely electoral purposes. This isn’t really about the party. It is about engagement with the state, and particularly the local state. You’ll need to develop a dual power which is about mobilizing people for the provision of services, and taking quite direct political action within communities to take on a semi-state role. That would give a focus for people who want to push forward the political revolution and make it real and permanent. It would maintain popular support, and it carries an implicit critique of the way the state has been set up and organized. That’s if he becomes the president. He’ll die if he’s on his own in there. You can’t just use the power of the presidency to negotiate with forces that are antithetical to what you want to do. It’ll also need popular councils to arrive at policies. Bernie’s been fairly light on the specifics of how he’ll govern. He kind of necessarily has to be. It’s difficult to say, “first we’ll be in a joint process of engaging with and changing the system fundamentally, and through that process will emerge the kind of outcomes you want to see.” You also can’t just say we’ll give 5 percent more spending to education, because that’s not a political revolution. It’s good and that should happen, but it’s not a political revolution. Outside of an election, how can Momentum influence something like, say, the budget? If you’re out of power within our system you can’t change policy that much directly, although you can indirectly. The budget is a good example of that. The effect of Corbyn on the political discourse in under a year has been dramatic. Iain Duncan Smith, the Work and Pensions Secretary — the person who spent the last six years orchestrating cuts — said, in resigning last month, that austerity is more of a political than an economic choice, which is completely the Corbyn line. Now, Smith is on the right of the Conservative Party. He’s not had some kind of left conversion. But Corbyn has moved basic political common sense. This budget has made the austerity agenda seem both straight-up mean and straight-up incompetent. It’s easy to see the impacts of Corbyn’s leadership on that. For months he argued that our priorities should be different on moral grounds. But then the shadow chancellor, John McDonnell, laid out Labour’s alternative economic strategy, and has been bit by bit tearing pieces of the Tory’s economic credibility. What else is Momentum working on now? We’ve got 130 groups across the country. Depending on where they are they do different things. Generally, they’ll meet once a month in a community center or town hall and discuss what local campaigns they want to do and collectively run them. There’s a huge diversity of things that people are doing across the country. One thing we need to do way more of is to knit those together more, for mutual support between campaigns but also to show the scale of grassroots political activism that is taking place. It falls below the media radar, but — more importantly — it falls below the radar of other people who might be interested in doing this. If you see that they’re trying to close a ward in your hospital and you know about six other campaigns that are trying to stop the same thing, then you’re way more empowered to do something. On the national level, we started with the voter registration drive because there’s a kind of gerrymandering taking place, knocking over two million people off the electoral register by changing the way voter registration works. Up next are important local and regional elections, and elections in Scotland and Wales. So we’re doing a lot of traditional campaigning to get people out and voting for Labour candidates. Last week we put out a survey to our supporters asking what their campaign priorities are. We’ll have a new set of national campaigns that will come out after the May elections. We’re now in support, at the national level, of all sorts of currently running campaigns, particularly the junior doctors strike. How are those campaigns going? You definitely can’t put this all down to Corbyn, but he has lit something. The junior doctors strike is an industrial action supported by two-thirds of the population. Britain’s steel industry is currently under threat of being completely closed down, and something like 62 percent of people want it to be nationalized. Eighteen percent don’t, and the rest don’t know. Nationalization is the argument being put forward by John McDonnell, and it’s got overwhelming support. These are arguments that have not been put forward in Britain in a very long time. And now they’re getting an airing. That’s not to say that all we need to do is talk about socialism and then suddenly everyone will like socialism. There are still not the social blocs developed yet in society that are in a position to be able to actively transform it. But these are both big advances in that direction. Any last words of advice to people who want to see the Sanders campaign’s momentum move forward? Whatever happens, build on the thing that reduces the structural power gap between you and the real enemy, which isn’t the Clintonite, plutocratic wing of the Democrats. For Sanders, that’s the ability to have half-a-million people who are doing some kind of activism weekly, a highly decentralized ability to raise money, etc. Whether he wins the nomination or not, the campaign needs to clearly articulate the political strategy of this movement. And then, of course, figure out how people in the movement can then engage with the strategy and try to change it. Another thing is that you’ve got to decide what the relationship is to the Democratic Party, in a variety of ways. If you’ve got half a million people you are the biggest movement of people being active. But how do you engage with all the other movements that are transforming the country? How does the Sanders movement relate to Black Lives Matter? Who does it relate to in the Fight for $15?